The MTQ assessments are high quality online psychometric measures used to assess Mental Toughness in an individual. They have been developed in collaboration between Professor Peter Clough of Huddersfield University and formerly of Manchester Metropolitan University, and Doug Strycharczyk, Managing Director of AQR. MTQ assessments are reliable and well-validated psychometric measures, which are easy to use and the results are simple to understand and analyse. MTQ PLUS, the Mental Toughness Questionnaire, measures an individual's resilience and ability to cope with pressure and change around scales of Challenge, Control, Commitment and Confidence. The questionnaire is online, well validated and takes approximately 15 minutes to complete. The development of MTQ PLUS was led by Doug Strycharczyk who was supported by an elite academic team led by Prof Peter Clough (Now Huddersfield University) and Dr John Perry (Hull University). The MTQ48, an online psychometric measure which takes 8-10 minutes to complete, is a normative measure that has been well researched and validated around the world and is now used extensively in the occupational, educational, social and sporting sectors. MTQ48 was developed in collaboration between Professor Peter Clough of Manchester Metropolitan University, Dr Keith Earle, Senior Lecturer, at the University of Hull and Doug Strycharczyk, Managing Director of AQR. It can be accessed online in English, simplified Chinese and twelve other languages. 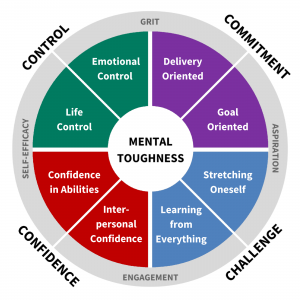 The measure comprises four key components of the personality trait of Mental Toughness, known as the 4C’s Control, Commitment, Challenge and Confidence, and the results indicate a range of Mental Toughness from 1-10 for each of the 4C’s and overall. Development Report – which provides feedback on results to the individual and contains suggestions for their development. Coaching Report – which provides the manager/coach with narrative about the persons Mental Toughness and offers coaching suggestions to help them to guide more effectively. Assessment Report – which is designed for selection and provides at least 5 questions on each scale to enable hiring managers to probe individual’s results more effectively. Distance Travelled Report – this is a comparison report based on a current and previous assessments for an individual. Widely used in training and development, this will identify areas in which individual’s scores have changed or remained the same after a period of intervention and is valuable in ROI studies. Organisation Development Report – this is created from data gathered from individuals who form a particular group and takes the form of histograms to show patterns of scores for that group. This report is useful in identifying trends and patterns within a group and may be an indicator of cultural issues within an organisation. The reports and the narrative are incredibly useful to both the individual and the organisation for reflection, discussion and subsequent action.